We've been very busy putting together two special edition ebooks for our fans. A few days ago, all the manuscripts were uploaded and are available in pretty much every ebook store by now. 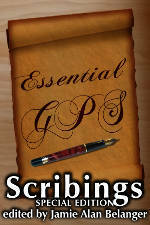 First, is Essential GPS: A Scribings Special Edition. This ebook contains a selection of stories from previous volumes as voted by friends, family, and fans this autumn. This ebook was released on November 30, 2015, and should be available for free in every major ebook store (but you may have to ask Amazon to price match for the Kindle version). 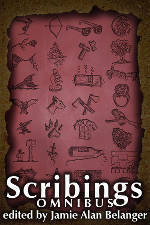 Our second release is The Scribings Omnibus, an ebook compilation of stories from our first five volumes. Nearly every story from Vol 1, Vol 2: Lost Civilizations, Vol 3: Metamorphosis, Vol 4: Miscreations, and Vol 5: Inversions is contained in one giant ebook.